We are pleased to enclose a 2-page overview of our school’s “report card”. Report cards answer important questions about a school’s overall performance and contain specific information about student enrollment and teacher qualifications, student achievement, accountability, how a school is performing relative to other schools in the district and the state, and the progress made toward narrowing proficiency gaps for different groups of students. The 2016 complete school report card for Newton North can be accessed through this link http://bit.ly/2hja2wu. Assessment results: This section of the report shows how our students are performing on the Massachusetts Comprehensive Assessment System (MCAS) assessments as compared to the district and the state. Accountability and Assistance Levels: Schools and districts are placed into one of five accountability and assistance levels (1-5), with the highest performing in Level 1 and lowest performing in Level 5. Our school has been placed into Level 1 because we met our proficiency gap narrowing targets for all students and for high needs students. School Percentiles: A school percentile between 1 and 99 is reported for most schools. This number shows the overall performance of our school relative to other schools that serve the same or similar grades. Our school percentile is 87. This means that our school is performing higher than 87 percent of the high schools in the state. Newton’s district overview and complete report card can be viewed through each of the links below as well as on the district website. Print copies can be viewed at the Superintendent’s office, Newton City Hall, or the Newton Main Library. For more information about our school’s report card, please feel free to contact us at 617-699-6200. 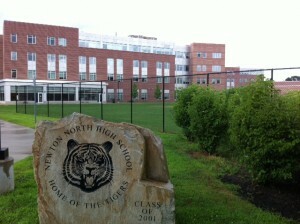 Category: Newton Schools · Tags: NNHS "Report Card"